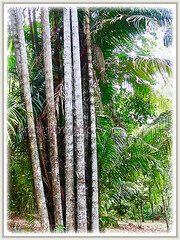 Nibung Palm or Nibong is a gorgeous-looking, tall and densely clumping palm whose trunk is armed with long, slender and black spines that are 5-10 cm long. 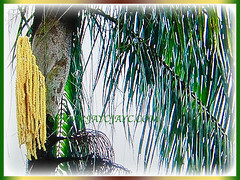 An extremely unique and very attractive palm that is grown in lowland swampy forest and among mangroves. Botanical Name: Oncosperma tigillarium (syn. 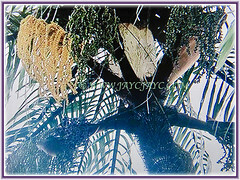 : Areca tigillaria, Areca nibung, Oncosperma filamentosum). 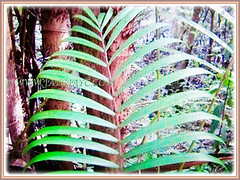 Common Names: Nibung Palm, Nibong Palm, Nibung, Nibong. Etymology: The genus Oncosperma comes from two Greek words oncos, meaning humped or swollen, and sperma, meaning seed, in reference to the broad raphe on the seed. 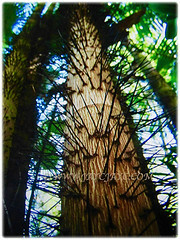 The species epithet tigillarium means with small stems, in reference to its thin trunks. Origin: Native to Malaysia, Indonesia and the Philippines. Features: Oncosperma tigillarium is from the genus Oncosperma that consists of 6 accepted species of palm trees. 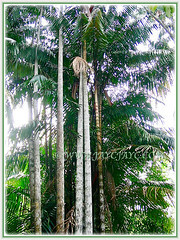 A 25 m tall densely clumping palm with up to 50 slender trunks, coloured greyish to light brown and ringed with prominent leaf scar rings. 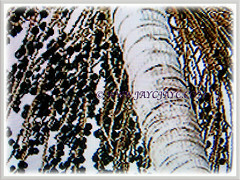 The trunks of the palms up to 15 cm in diameter are covered with long and slender black spines that are 5-10 cm long. One of its common names, ‘nibung’ meaning thorn, referring to the long thorns that arise along the length of the palm’s trunk. Light green crownshaft up to 1.5 m long is conspicuous. It produces 2-4 m long, dark to bright green, leathery and fine pinnate leaves that are elegantly arched with very attractive pendulous leaflets. 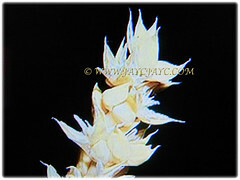 The leaflets are uniformly distributed on the rachis in the median part and about 50 cm long. Flowers are arranged in groups of three, a female flower amidst two male flowers. The spadix is 30-40 cm wide and longer at crown apex. Eventually, the flowers will develop into globose fruits, about 1 cm in diameter, mildly-depressed and turning from green to blackish purple when ripe. Culture (Care): Oncosperma tigillarium can be grown easily with least maintenance. Nonetheless, it requires tropical conditions. Moisture: Moderate water requirement. Since it originates in swampy areas, regular watering is needed to keep the continuous presence of water in the soil. 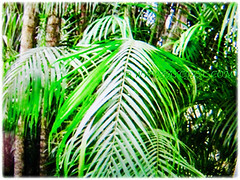 Soil: A moisture-loving palm that adapts to any type of soils that’s not easily draining. Others: This palm requires no pruning at all as dead leaves will fall off themselves to the ground. Once every quarter, feed the palm with a slow-release granular fertiliser formulated for palms that has nitrogen, phosphorous, manganese and potassium. Generally, it is free from serious diseases and pests. Oncosperma tigillarium or Nibung Palm can thrive in the hot, suntrap, humid conditions of the tropical lowlands but is able to withstand partially subtropical locations. Temperatures close to 0°C even for a short period can destroy the whole aerial part. It grows best in areas where the mean annual temperature falls within the range of 20-30°C but can tolerate 10-35°C. This beauty flowers in summer and fruits in winter. Propagation: Easily propagated by seeds that germinate within 2-3 months. Pre-soak the seeds for 24 hours in warm water before sowing in containers. Alternately, can be propagated by suckers. 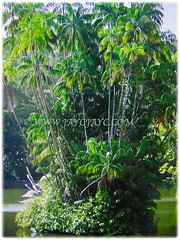 Usage: Oncosperma tigillarium or Nibung Palm is a very attractive palm that’s ideal as a landscape plant for large garden and public parks. An excellent palm tree for coastal, beachfront and shoreline. Its leaves are intertwined to make baskets and for thatching. The palm hearts are consumed raw in salads or cooked as a veggie and flowers are used to flavour rice. It has extremely hard and rot resistant wood which is used in fish traps in the estuaries and other submerged structures. The trunks without the thorns are utilised for house construction, especially for the foundation piles of elevated houses, split into planks for flooring and boat building.